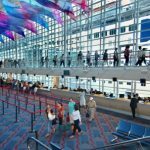 Carnival Cruise Lines recently began operating from Terminal D and Terminal E, the newest passenger facilities at the Port of Miami. 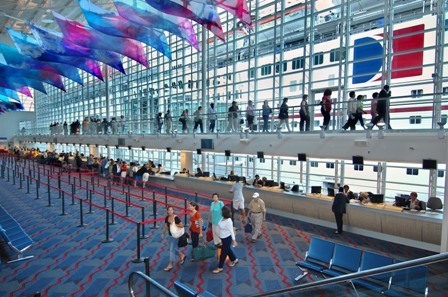 Designed to provide panoramic views of Miami and Biscayne Bay, the stylish and modern terminals can accommodate approximately 4,000 guests through separate embarkation and debarkation facilities. Dual entry lobbies on the ground floor lead to four security scanners, and twin escalators lead to the second level — a large hall with 50 check-in stations, a VIP lounge, two private group check-in areas and embarkation offices. After check-in, escalators convey guests to the third floor through an “experiential” photo area to the boarding corridor and loading bridge. The Customs and Border Patrol area has been designed to consolidate immigrations, customs and agricultural inspection functions. The baggage-claim area has a conveyor belt and carousel system similar to those used in airports. The décor features Carnival signature red, white and blue colors and patterns. Flat-screen televisions display a welcome video hosted by Carnival’s mascot, Fun Ship Freddy, and an audio system plays soft Caribbean background music. In December construction is scheduled to begin on a 750-car parking garage at Terminal D.
Does this terminal have valet parking like Tampa has? That was so nice on our last Carnival cruise. Just drive up empty the car and be able to go into the terminal. Not have to go park the car then come back and try to find my wife. On debarkation your porter took your luggage to a waiting area and the valet brought your car there. It was so nice. I had to ask around to find out the answer. And as of right now, we don’t offer valet parking at the Miami terminal. But we’ve definitely added it to our list of recommendations.